ICM is a critical care journal that publishes studies covering all aspect of critical care from every country. The journal publishes studies that include critically ill patients or patients at very high risk of becoming critically ill and, in addition to those investigating critically ill patients in the ICU, welcomes studies of high-risk patients in the Emergency Department and during the perioperative period. Professor Elie Azoulay’s mandate as Editor in Chief of the ICM journal has now come to an end. The ESICM is eternally grateful for everything that he has achieved for the journal which is considered a top-ranking critical care journal. Under his leadership the journal has reached a remarkable impact factor of prime importance that the Society is extremely proud of. 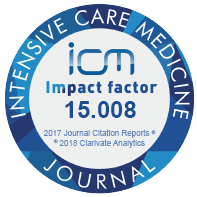 The journal is one of the foremost benefits of ESICM membership and the number and quality of submissions have soared each year. We have not only Elie to thank, but a large and learned group of Associate Editors and Board of Reviewers, who have worked tirelessly to reach this result. We welcome incoming Editor in Chief, Giuseppe Citerio, Professor of Anesthesia and Intensive Care at the Milano Bicocca University, School of Medicine and Surgery, and Director of Anesthesia and Neurosurgical Intensive Care at the San Gerardo Hospital, Monza. Previously Senior Deputy Editor of the journal, Past Chair of the ESICM’s Division of Scientific Affairs and Editor of the “Oxford Textbook of Neuro critical Care”, Giuseppe’s talents, experience and work ethic will ensure that the journal will be in very safe hands. The journal Intensive Care Medicine provides a medium for the communication and exchange of current work and ideas in this field. It is intended for all involved in intensive medical care, physicians, anaesthetists, surgeons, pediatricians, and all concerned with the pre-clinical subjects and medical sciences basic to these disciplines. Review articles reflecting the present state of knowledge in special areas or summarizing limited themes in which discussion has led to clearly defined conclusions. Original papers reporting progress and results in all areas of intensive care medicine and its related fields. Educational articles giving information on the progress of a topic of particular interest. Discussion on technology, methods, new apparatus and modifications of standard techniques. Correspondence concerning matters of topical interest or relating to published material. The journal is open for publication of supplements and for publishing abstracts of scientific meetings. Conditions can be obtained from the Editor-in-Chief or the publisher. Color figures are free of charge and the journal follows Springer’s Open Choice policy for authors (publication of papers in open access, for a fee).